The idea of mixing entirely different sounds for the high and low end isn’t a new one – bass players have been doing it for years and Roger Mayer experimented with this technique on Jimi Hendrix recording sessions way back in the day. Ever wanted to split your sound off into two distinct ranges with different distortion levels and EQ settings? Me too, and it’s something I sometimes mess about with in software amp sims. Oh how I wish something similar could be achieved with my real amp… well lo and behold, Roger Mayer to the rescue! The Metalloid gives you two separate distortions, one for the low end and the other the highs. Each distortion band has a drive control and an EQ control, while on the back of the pedal are mix and output controls – the former allows you to set the perfect blend between the two distortions, while the latter controls the pedal’s output level (which you can use to push a tube preamp into meltdown). There are a pair of buffered outputs for driving two amps, plus a true bypass output if you’re of the ‘everything must be true bypass’ persuasion. The great thing about including both here is that you can select the one that’s best for your needs. The true bypass out is great for short cable runs and minimal pedalboards, while the buffered outs maintain signal strength over long cable runs, and to my ears they just sound that little bit beefier. The best way to start using the Metalloid is to turn the mix knob all the way in one direction, tweak that tone, turn it the other way, tweak that one, then find the ideal setting on the mix control and make any small adjustments as necessary. 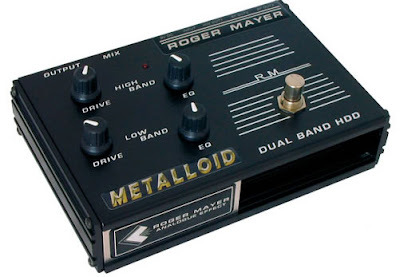 Although this pedal is called the Metalloid, it’s not really a metal distortion as such. It’s a little too woolly for modern Bullet For My Valentine or Lamb of God styles, for instance. It works much better for more old-school gain styles from Sabbath through to 80s Megadeth, but it’s even better for fine-tuning the mix of bite and punch for low-gain country, blues and indie sounds. I actually found most of my favourite settings residing at this lower end of the gain range, using the output control to punish my Marshall’s tube preamp if I needed a little more distortion. Medium gain ranges sound great (especially with the high end gain around 6 with tone on full and the low end around 4 with tone around 6), but anything past 7 gets a bit woofy – a sound you could really use the hell out of for stoner rock or mid 90s grunge. Still, I can’t help feeling that the Metalloid’s greatest quality is subtlety rather than over-the-top distortion, and you’re missing out on a lot of what it has to offer if you just crank it up all the way. Roger Mayer’s pedals have always been about the small details anyway. While I kinda with the Metalloid had a thicker, more grindy distortion tone and perhaps the ability to tweak the midrange too, the lower gain settings in particular will appeal to a huge range of players, especially in the blues, country and indie realms, while the middle section of the gain range is great for classic rock and early metal styles. ← Previous Previous post: GIG ALERT: Halloween Showcase of Death!